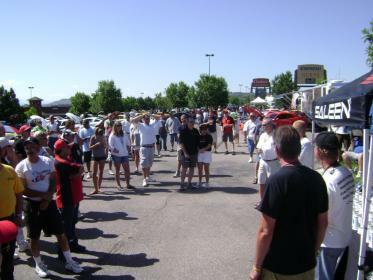 The 2010 Saleen NATIONALS will be held in Newburgh NY. The weekend includes 3 days of events with the Saturday show held at the Orange County Chopper headquarters. This is the national convention for Saleens and is hosted by the New England Region of the Saleen Club of America. You don't have to be a member of the Saleen Club of America to attend. Although the focus is on Saleens, other Mustangs will be attending. It only happens once a year - there wil be a 100 Saleens there, make it 101. You won't regret it! There's always an adventure around the corner at the NATIONALS! Last edited by scspeedster; 09-30-2009 at 08:53 AM. FWIW the Saleen National Show rotates around the county to give everybody a chance to come to it from a "local" location. The Nationals is THE Saleen show to be at for the year. Looks like a good time. Would have loved to climb Pikes Peak. Any idea on the rotation when its going to head down south again? Florida. The next time it comes further south I might go. Even though I haven't completely decided on not goign to New York. Not sure when it will be in Florida - we'll start taking bids soon for the 2011 and you never know. There are Regionals and State Reunion in the Southeast, maybe try to make one of those until the NATIONALS comes your way - visit our website and look at the events http://scoatalk.saleenclubofamerica.com. Last edited by scspeedster; 10-01-2009 at 08:37 AM. You will be so glad you made it to New York, you won't think twice about going to the next one, wherever it is (even if you have to fly in for the weekend). Last edited by Saleen Mike; 10-01-2009 at 10:18 AM. Cypress Gardens show is off the schedule. The park has closed its gates for good. S281E- got your car tuned yet? As for the 2010 Nationals. It is a $220 roundtrip ticket from OIA to Stewart International in Newburgh. I flew up for the regional show this year and it was a great time. Economy permitting, I will be trying to drive up next year for the Nationals.